China. 30 years ago percieved as populous and in many ways underdeveloped country. Nowaday one of the most important participants in international politics, economics and media debates. The role of the individual, family and social values has fundamentally transformed. „Heaven“ presents reverse side of Chinese progress. It shows how Chinese society faces its most vulnerable: physically or mentally handicapped children that their parents could not or did not want to take care of. Tomas Etzler, who has more than a ten years of experience as a CNN, ČT and many others international companies associate and therefore knows China as hardly anybody. Thanks to his contacts, he is able to get places that are normally inaccessible to Europeans. Kiev, Ukraine. Many social organizations suffer from a lack of money. Social system is often substituted by Church, paid professionals are replaced by volunteers. Faith helps people more than social programs. 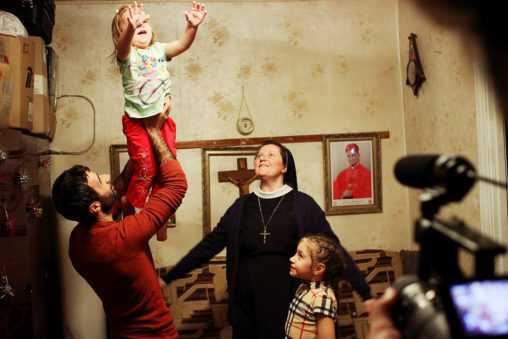 That’s why we are focused on stories of people in difficult situations: drug addict who first came to believe in God in the Christian center; the refugees from Doneck who are aided by nun; a former drug addict who tries to take his life into his own hands. Do these people have possibility of free choice? How far is Ukrainian reality from the European?